Group Photo info – From left front row. Emma Townsend,Vicky Glover, Kim Gregg?, Emma Soffe, Mrs. Siebert, Sandra Townsend, Natalie Bird, Melanie Tuck, Ellen ? Back row. ?, Ian Appleby, ? , ? , ? 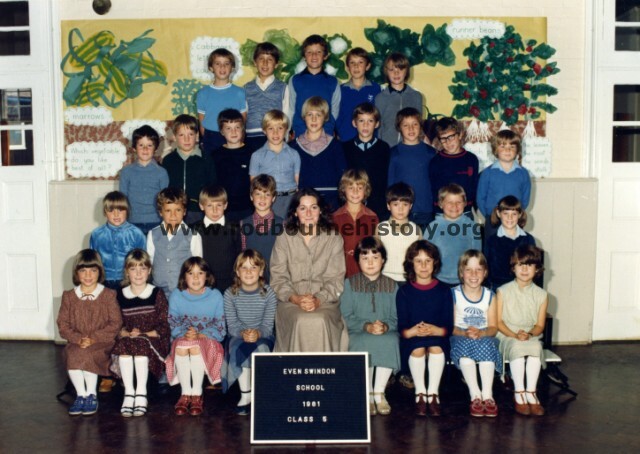 Re: Even Swindon School picture of class 5, ID number 389, Image No img093 – I’m actually in the picture – as you look at the picture, I’m on the front row, sitting next to the teacher. My name then was Sandra Townsend. Thanks for the info. Photo caption has been corrected. Kim in front row is Kim Diamond I believe. Her brother Gareth Diamond is in the very top back row 4th from left. Their dad was a Policeman and they lived in Montague Street. Simon Cain is the one with the glasses in between lee illes and david bond. My sister is Natalie Bird in front row, how I’m aware of others. Maybe wrong with Kim assumption, believe others are correct. Thinking now Gareth Diamond’s sister was called Gina? not the same age as Gareth. Thanks Stuart for the clarification on the identity of pupils. The information regarding Gareth & Gina Diamond’s Dad being a policemen is just the kind of information we need. I’ve corrected the photo caption but left a ? against Gina Diamond as you are not 100% sure of her Christian name. I believe the girl front row third from the left is actually Kim Gregg and I think she lived on Rodbourne road and she was not Gareths sister! and back row far right…Wayne Higgs?? Thanks Emma for your comments. This certainly is a lively debate about the front row. I’ve revised Kim’s identity but maybe Stuart could respond if he doesn’t agree. Regarding the 2nd row Emma, an apology by e mail is on it’s way to you as I have discovered on the back end of the site an unpublished comment of yours dated 30/06/2010 which I obviously used to correct names at that time but made an error which you have again pointed out. I suppose this is a lesson to all administrators. Publish all comments other than racist, ones which may give offense, and foul language.